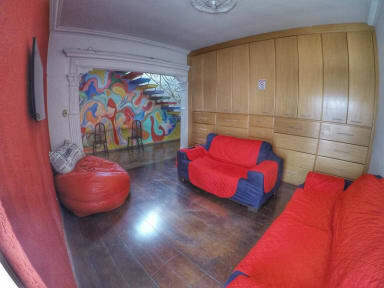 Red Monkey Hostel: Agua Branca aims is to provide the best option for travellers looking to meet other travellers and experience the city while enjoying the stay in a beautiful house. Guests at the hostel can enjoy a buffet breakfast. Red Monkey Hostel: Agua Branca offers a sun terrace. Staff at the 24-hour front desk can provide tips on the area. The hostel is located in a very lively neighbourhood, one of the best in the city. Everything you need is in a walking distance: metro and bus station, ATM's bars, clubs, restaurants, shopping centres, a park, football stadium and much more. All our dorm beds come with contains for extra privacy and electric outlet (we know you want to charge your phone/computer). We provide fresh clean sheets on arrival, free WiFi and TV room.